Believe it or not, with a little prep work and planning, it's pretty easy to get dinner ready in under 10 minutes. 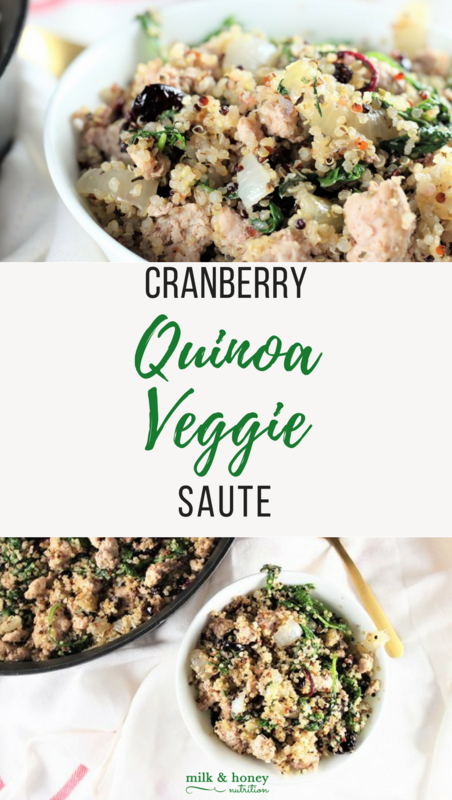 One-pan/pot dishes are the best for this... including this Cranberry Quinoa Veggie Saute. It's what I like to call, an "assembly only" dish. If you take a little time, and prep the following a few days ahead (or whenever you have a spare 20ish minutes), you really only have to assemble the ingredients in your saute pan the night of, heat for 10 minutes, and done! But, if you don't have time to prep these ahead of time, don't worry. This recipe only takes 30 minutes from start to finish if you're starting from scratch! Enjoy! Optional seasonings: Salt, Pepper, Garlic powder, italian seasoning, etc. Heat the avocado oil in a large pot over medium heat. Add the onions, and sauté with lid on until translucent (~10min). Add the garlic, stir, and heat with the lid on for 5 min. Add the ground meat, stir and heat until meat is fully cooked. Add in the cranberries and green vegetable, stir and heat with lid on for 5 minutes. Add your favorite seasonings to taste. I like to use garlic powder, salt, and pepper. Add in cooked quinoa. Stir until fully mixed, add toppings, and enjoy! Check out these other great dinner ideas!